A new Lenovo device, released just today in its homeland of China, is shaping up to be quite the competitor in the ultra value segment where local rivals Xiaomi and Meizu currently reign supreme. Dubbed Lenovo K3 Note, the new phablet packs quite the punch for what is a devices costing just ¥899 (~$145). For that kind of money, you're getting quite a bit in return. The Lenovo K3 Note sports a 5.5-inch display with a sharp resolution of 1080 x 1920 pixels (401 ppi), has an octa-core MediaTek MT6752 coupled with 2GB of RAM, 16GB of expandable storage, a 13MP/5MP camera combo, and a healthy 3,000 mAh battery (with wireless charging?). 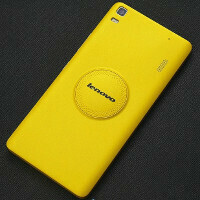 The back of the 0.3 inches-thick (7.6 mm) phone is made out of yellow polycarbonate and houses a peculiar, round Lenovo logotype in the middle. Also found on the rear are a loudspeaker and we can even see a dual LED flash under the recessed camera sensor. Other detail around the Lenovo K3 Note include two SIM slots, one of which supporting 4G LTE, and an exclusive China Unicom release for now (meaning that it will support international 3G network bands). It remains to be seen when the device will be made available to the local masses and if Lenovo has any intention of spreading the love to far-away lands. Same specs as Meizu's m1 Note but has additional expansion slot. But m1 note looks better than this with better looking UI. ug yellow bleh luckily wont be a US problem. nice phone in a different color. Now we can add another phone to the list of "Notes" not made by Samsung. Expendable memory is very less.. It should be 128gb..
what does that circle really do other than making the phone even uglier than it already is? It would be nice in black-n-white colour.